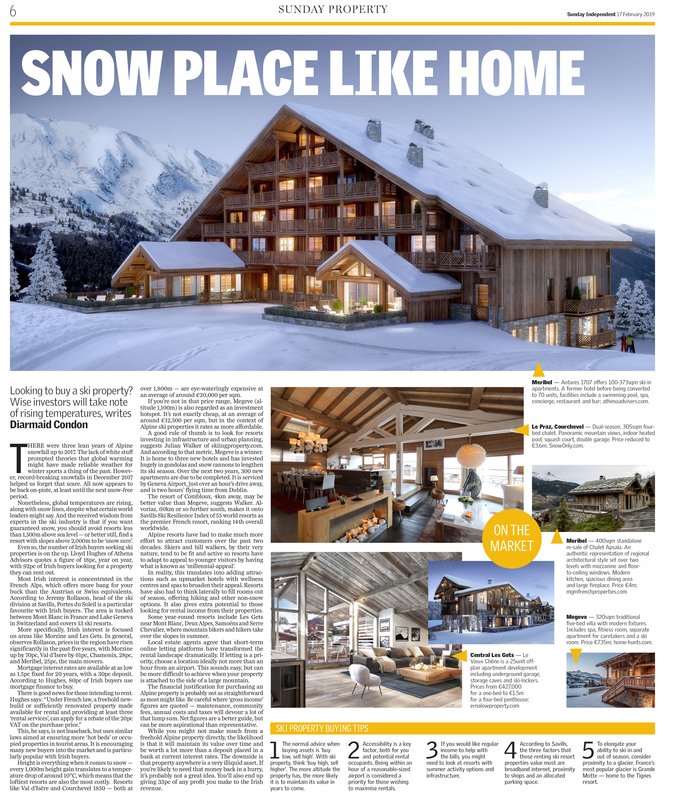 On Sunday February 17th there is a ski feature in the Sunday Independent. This is just an accompanying post with some extra links, documents and phone numbers that I couldn’t fit into the article. Photo courtesy of Val d’Isère Tourisme. There’s a link to a scan of the full article at the bottom of this piece. It is available online here – https://www.independent.ie/life/home-garden/snow-place-like-home-37822791.html. In the piece I mention annual ski reports released by both Savills and Knight Frank. These are very useful if you want some overviews of the ski industry, trend data for prices and area comparisons of amenities and facilities. You may have to register your email to get them. “There’s also a new trend happening in terms of the VAT. And before you think it, this isn’t leaseback. 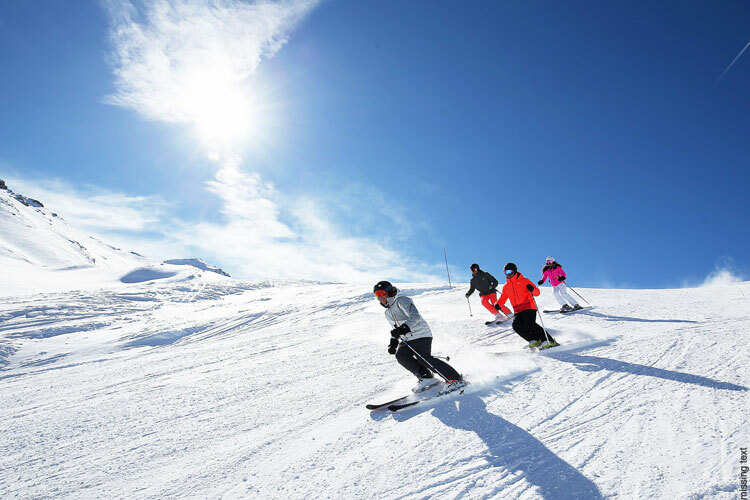 We’ve noticed a trend of exponentially increasing mid-to-high-end ski buyer numbers who are applying to get VAT rebates on their French property and are getting back significant amounts of money. Under French law, if a buyer of a new-build or sufficiently renovated property (freehold) opts to make their property available for rental and provides at least three ‘rental services’ then they can apply for a rebate of the 20% VAT on the purchase price. The French authorities do this in order to ensure as many ‘hot-beds’ in a resort as possible to boost the tourism receipts. Previously this law was only used by developers creating ‘Residences de Tourisme’, which are freehold properties offered with obligatory, often restrictive and non-lucrative rental management contracts in place. The freeholds are then sold with management contracts offering a few weeks usage per year and then a guaranteed yield based on your usage. Such properties have normally been offered at the lower end of the market. For further information contact Lloyd Hughes of Athena Advisers on lloyd@athenaadvisers.com. Megève – 320 sq. m. traditional five-bed villa with modern fixtures. Includes spa, fitness room, separate apartment for caretakers and a ski room. Price is €7.35m. You’ll find the property on the Home Hunts website at https://bit.ly/2UC0OvR, email info@home-hunts.com and phone 0044 208 144 5501. Le Praz, Courchevel – Dual-season, 305 sq. m. four-bed chalet. Panoramic mountain views, indoor heated pool, squash court, double garage. The price of this property has been reduced to €3.6m. YOu’ll find the property at https://bit.ly/2UCYMM1. SnowOnly.com is a new portal launched for those looking to buy and sell ski properties exclusively. It also features a range of information for potential buyers and sellers. Méribel – This is a former well known hotel, Antares 1707. It offers 100 to 373 sq. m. off-plan ski-in apartments. It is being converted into an apartment development of 70 units. Facilities include swimming pool, spa, concierge, restaurant & bar. You’ll find the property at https://bit.ly/2MM3O5Z. You can contact Athena Advisers at athenaadvisers.com email info@athenaadvisers.com or call 0044 207 4714 500. Méribel – 400 sq. m. standalone resale Chalet Apsara. An authentic representation of regional architectural style set over two levels with mezzanine and floor to ceiling windows. Modern kitchen, spacious dining area and large fireplace. The asking price is €4m. You’ll find the property at https://bit.ly/2Rxv4pJ. Further information from 0044 207 494 0706 or visit mgmfrenchproperties.com. Central Les Gets – Le Vieux Chêne is a 25 unit off-plan apartment development including underground garage, storage caves and ski-lockers. Prices from €427k for a one-bed to €1.5m for a four-bed penthouse. The link for the property is https://bit.ly/2S9jFS6. For further information email enquiries@ernalowproperty.com call 0044 20 7590 1624 or visit ernalowproperty.com.